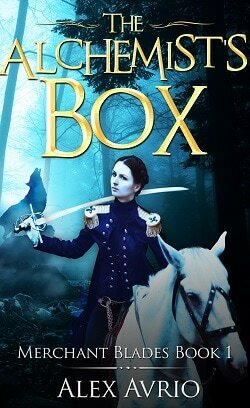 When Captain Regina Fitzwaters’ misguided scheme to leave the tough life of a mercenary behind her backfires, the underworld bosses of Border Town offer her a way out: Bring them the mysterious Alchemist’s box from the neighbouring Duchy of Pella. The catch? She must work with Maximillian Jaeger, a former enemy in the recent bitter war. Now she must overcome her prejudices and trust him with her life. On arrival in Pella, nothing is what it seems. Why have the niece and nephew of the Duke developed such an interest in the team? What are the mysterious happenings in the court? What does the Alchemist’s box contain that is worth killing, and dying, for?